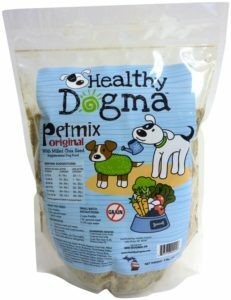 Healthy Dogma’s Petmix Origninal home-made dog food is a great and healthy option for your dog’s meals. The great thing about their pre-mixed dog food blend is that most of the work is already done for you! The only thing left to do is heat up your dog’s choice of protein in a pot of water, then add the Petmix to the pot once the chicken, beef, or turkey is cooked thoroughly. Turn of the heat, stir it in, then let it sit and cool down until it’s ready to serve. Store it in the fridge or freeze some of it if you know your pup can’t eat the whole batch within a week or so. We’ve yet to see a dog that isn’t crazy about this dog food so we are confident your dog will love it too! Whole Egg, Apples, Flaxseed, Kelp, Broccoli, Green Beans, Sweet Potatoes, Bananas, Blueberries, Parsley, Celery, Lettuce, Watercress, Spinach, Coconut Oil, Calcium Citrate.